beat in. Flavor with lemon, dissolve a little citric or tartaric acid in a little water & stir it in. Beat until perfectly smooth & then spread. Caramel Filling (S Gray) 5 cups sugar, 1 of butter, & 1/2 cup sweet milk. Put on the fire & boil without stirring, When you think it is done, try by putting a little in a saucer & cut with a knife, if it is done it will cut clear. After removing from the fire stir in a tablespoon of vanilla, spread while warm. This will be enough for the filling & to ice the cake too. A cup of grated chocolate added to this make a delicious chocolate cake. Caramel Filling. 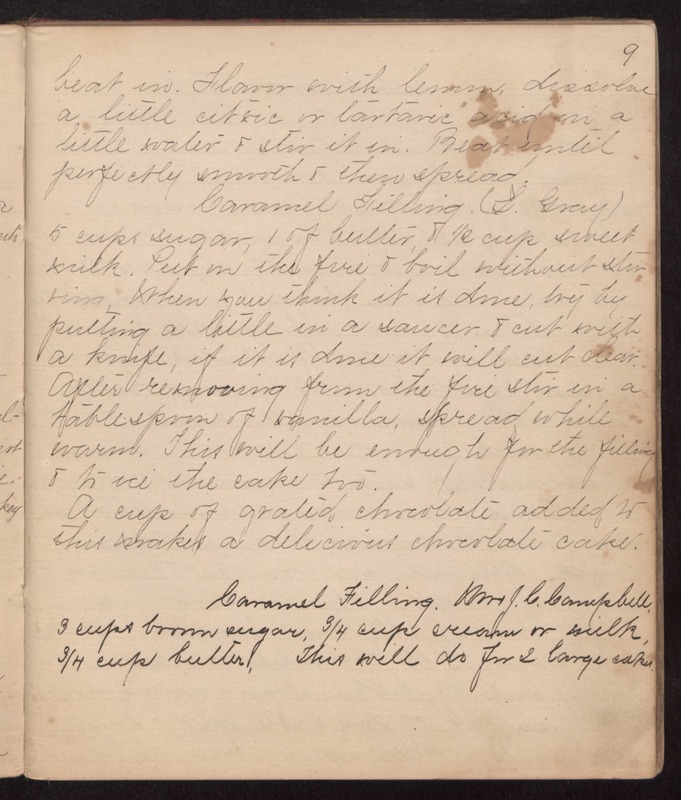 Mary J. C. Campbell, 3 cups brown sugar, 3/4 cup cream or milk, 3/4 cup butter. This will do for 2 large cakes.